This is the first general survey of Roman Italy that brings together the wealth of evidence available from literary sources, inscriptions, and the exciting recent discoveries in Roman archaeology. 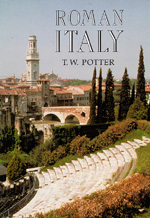 Written in a lively prose with the lay reader as well as the scholar in mind, Potter's account is one of the few to cover the whole period of Roman Italy. T.W. Potter is Assistant Keeper, Department of Prehistoric and Romano British Antiquities, British Museum.